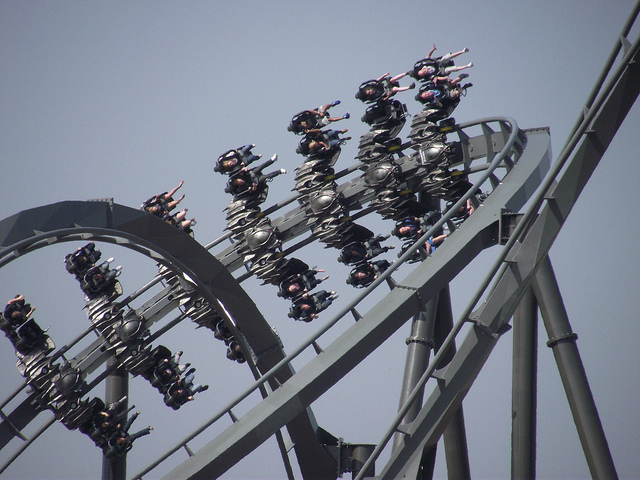 Silver Dollar City’s 2013 Project: Is it an inversion? 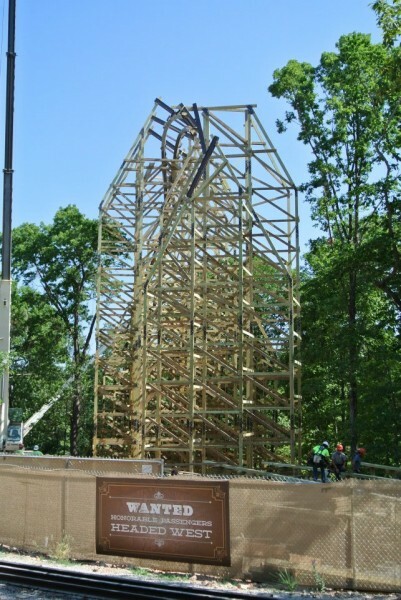 When construction images of Silver Dollar City’s “its-not-really-there” Rocky Mountain wooden coaster emerged, it was undoubtedly one of the most spectacular projects we’ve seen in a long time. Never before has wood been twisted in such extreme ways, from the immensely steep drop to the immediately following twist. As more bents went up, the track appeared to be going into a zero-g roll. It would be the only inversion on any wooden coaster in the world, since Son of Beasts had its removed in 2006. After measuring each image, multiple times, it was clear from those two images, the angle of the highest bent is 33 degrees. Meaning, that according to these measurements, the track is inverted at 147 degrees. Now, obviously we can’t achieve that degree of accuracy with the images provide, so we’ll round and assume a range of 140-150 degrees. 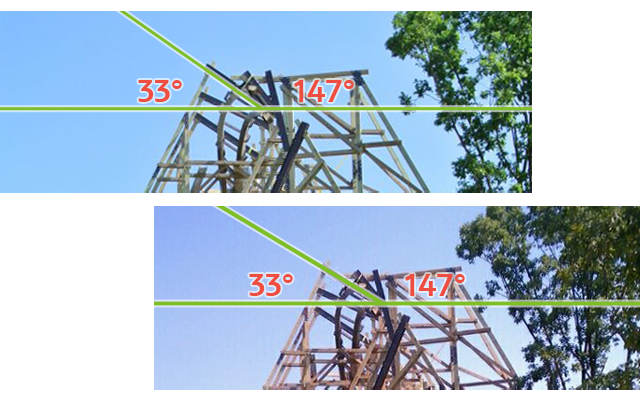 Before anyone cries fowl over these measurements I’ll share with you exactly how these were taken: I created a horizontal guide in photoshop and then aligned it to the wooden cross beam directly below the metal bent. As a whole, the image was tilted about a degree or so. Then, I used another, parallel guide and moved it up so it was clearly intersecting the bent. With the ruler tool, I drew two lines, one exactly on the guide the other following the edge of the metal bent. After doing this 2-3 times on each image, I always got an angle between 33.0-33.9 degrees. The lines drawn above are simply mock ups, not the actual method of measurement. So does that qualify as an inversion? Well my first thought would be “Not really…” as its a full 30+ degrees off from being truly inverted. The vast majority of inversions are more banked than this element. However, there are certain examples that make me question the conclusion, most notably, the inclined loop. This element is the inbetween of a vertical loop and horizontal helix. As far as the question of inverting goes, I would say its difficult to argue for the older models that the element isn’t an inversion. But nowadays, B&M seems to use the term very loosely, as The Swarm advertises having 5 inversions, with one of them being an inclined loop. But as CoasterMadMatt’s photo clearly shows, the trains barely crack 90 degrees, let alone 150. 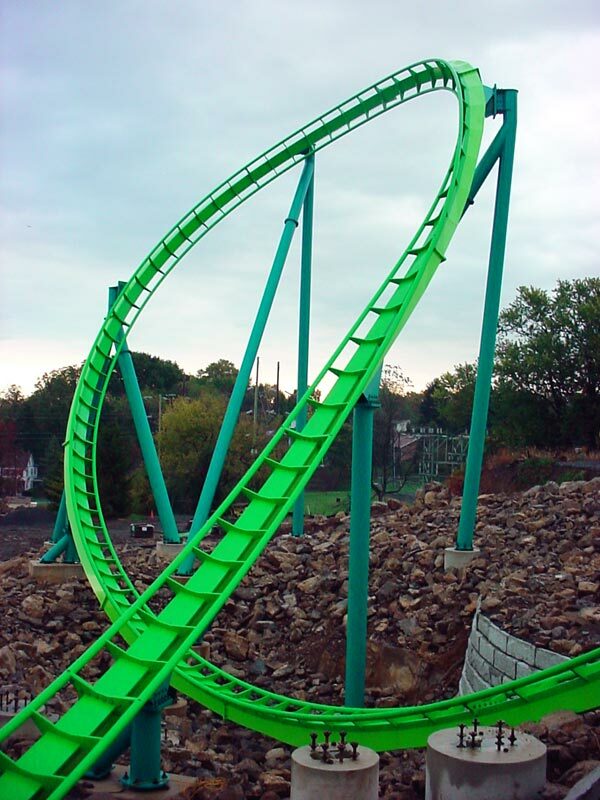 Additionally, Hydra’s “inclined dive loop,” which is also considered an inversion by the park and RCDB does not come anywhere close to inverting. So where does that leave us? While RCDB is a great resource, I question its classification of inversions. Even Bolliger & Mabillard a manufacturer seems to very loosely define them. From the message boards, it is clear there is a large following that believes its an inversion. So, will I consider this an inversion? No. The reason is rather simple. If Rocky Mountain Construction wanted an inversion, they would have clearly made an inversion. Between the rapidly change banking and the general directional changes of this element, its far more complex than had they just built a traditional zero-g roll with a straight entrance and exit. 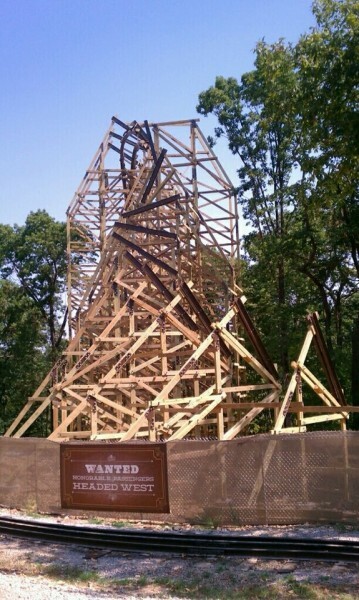 The marketability of the “World’s Only Wooden Coaster” is huge and having this “questionable” element would not cut it. Silver Dollar City would have ordered a clear inversion if they wanted to market it that way. But does it really matter? Inversions don’t make or break rides. Many of the world’s top coasters are inversion-less, and its not as if classifying this element as an inversion or not an inversion will change the overall experience. Its a matter of words on paper (or webpage), and nothing more than that. Discussing whether or not this is an inversion is turning into the new, “Is El Toro a wooden coaster?” topic. Who knows what the park will call it? I’ve been dead wrong about coaster construction in the past, and Rocky Mountain has continued to blow peoples minds time and time again with construction of this wooden behemoth. Perhaps the ride will have 3 corkscrews, a vertical loop, and drop section. Who knows. Either way, the rumored name Outlaw seems very fitting as this ride is certainly breaking all the laws of current wooden coaster design. So what do you think? Is it an inversion? Does it even matter? Leave a comment with your Park Thoughts below.